FBI Tries To Send Message With Hacker Arrests Law enforcement agencies worry that politically motivated "hacktivism" could evolve into more dangerous cyberactivity. So while the people arrested in a crackdown of Anonymous were not suspected of having links to criminal gangs or terrorists, the FBI was determined to go after them. 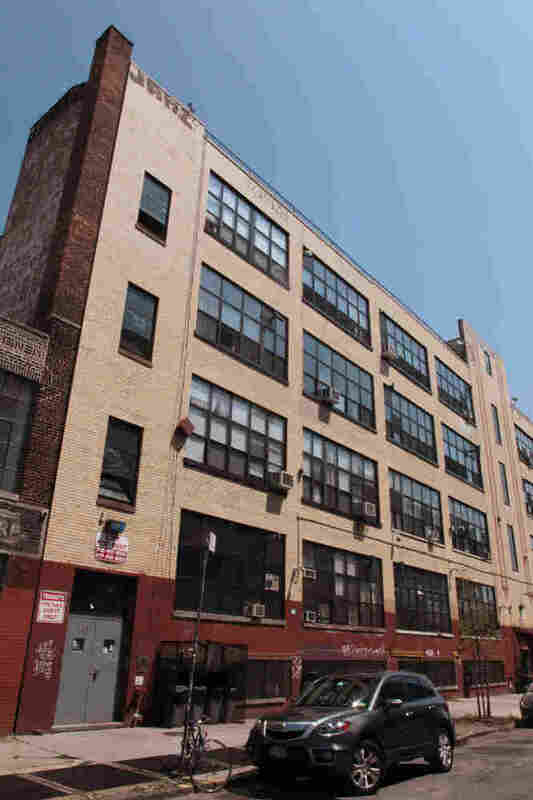 FBI agents seized computers from this building in Brooklyn and three others on Long Island on Tuesday. The agency said it was part of a probe into the hacker group Anonymous. The 14 people arrested Tuesday in a crackdown on the Anonymous hacking group are not suspected of having links to criminal gangs, terrorist networks or foreign governments. They are alleged only to have participated in attacks on PayPal's website, after that company cut off payments to WikiLeaks. But the FBI was determined to go after them anyway. "We want to send a message that chaos on the Internet is unacceptable," Steven Chabinsky, deputy assistant FBI director, said in an interview with NPR. "[Even if] hackers can be believed to have social causes, it's entirely unacceptable to break into websites and commit unlawful acts." That view is apparently shared by other governments as well. In addition to the U.S. arrests, one person was arrested by Scotland Yard in Britain, and the Dutch National Police arrested four individuals, also for illegal cyberactivities. "The investigative opportunities that present themselves in this area are transnational," Chabinsky, deputy head of the FBI's cyber division, said. "The resolution of these cases will involve international cooperation. The Internet has become so important to so many people that we have to ensure that the World Wide Web does not become the Wild Wild West." In addition, Chabinsky said, law enforcement agencies have to worry that politically motivated "hacktivism" could evolve into more dangerous cyberactivity, should organized crime or terrorist groups become interested in the hacking capabilities demonstrated by Anonymous or its offshoot group, LulzSec. "There has not been a large-scale trend toward using hacking to actually destroy websites, [but] that could be appealing to both criminals or terrorists," Chabinsky said. "That's where the 'hacktivism,' even if currently viewed by some as a nuisance, shows the potential to be destabilizing." The Internet has become so important to so many people that we have to ensure that the World Wide Web does not become the Wild Wild West. One scenario is that hackers could be tempted to sell their services to organized criminal or terrorist groups. Another is that outside actors could infiltrate a loose hacking group and steer its activities in a malevolent direction. "Most of the folks who are on these chat boards don't know each other," said Hugh Thompson, chief executive of PeopleSecurity, a private cybersecurity firm. "They have never met in person. So when someone has a dominant voice, you're not quite sure what their personal motivations are. One concern is that they may be able to influence the group to do something that the group never intended to do." The outside player, for example, may sway the hacking group to attack a company that a criminal gang has identified as a possible target. The penetration of the company's website could offer the gang an opportunity to see a weakness that could be exploited for criminal purposes. The pursuit of cybercriminals is complicated by the fact that the Internet affords considerable anonymity to its users. This week's crackdown on the Anonymous group was made possible in part by "good old-fashioned investigative work," according to the FBI's Chabinsky. "That includes getting out, trying to work with victims, finding out what they're seeing, finding out in the hacker community who knows someone that [has concluded], 'This just went too far,' even for their views. They don't agree with it," he said. "Slowly but surely you end up getting the leads that result in the kind of arrests we saw [Tuesday]." It remains unclear, however, whether the individuals arrested were key players in the Anonymous hacking operation or just careless in what they were doing. "I'd say many of those folks are not the people who are pulling the strings here," Thompson said. "A lot of these people may just have been enamored by the cause [and] downloaded a tool [for attacking a website]. Some of them may not have even known that they were doing something illegal," he said. "So I think we need to have an air of caution here to make sure the right people get appropriately prosecuted." Law enforcement officials point out that Tuesday's operation was part of a continuing investigation. FBI agents also executed 35 search warrants, and more arrests could follow. For its part, Anonymous is showing defiance. "We continue moving forward," one alleged LulzSec member said in a tweet after the arrests, along with the group's standard slogan: "We are Anonymous. We are Legion. We don't forget. We don't forgive. Expect us."